White Elephant Contest | #WIN $1,000 | Easy Entry! Have you seen gifts online that would make great white elephant gifts? Submit the best white elephant gift link in the White Elephant Gift Idea Contest! The best submission will win $1,000 ! Easy entry, submit your link and if your item is voted as the best gift you win! 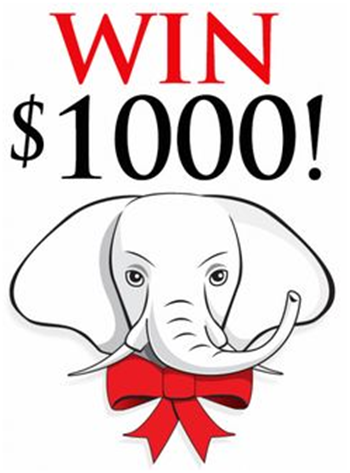 Fun and easy get your entry in and win $1,000 in the White Elephant Gift Idea Contest. Share and get your friends to vote for your entry, the submission with the most votes will be the lucky winner! Contest is open to anyone above 18 and limited to US – Canada. Submit by midnight the night of Dec 21st. Only one submission per email address. Legit email is required to notify winners. Link to an image, webpage, pin, or any url to the site entry form. Contest is open to anyone above 18 and limited to US – Canada. Submit by midnight the night of Dec 21st. Only one submission per email address. Legit email is required to notify winners. Voting will occur on Facebook until Dec22. Winner will be chosen the 23rd.